The reindeer has been part of Sámi culture and identity for thousands of years. 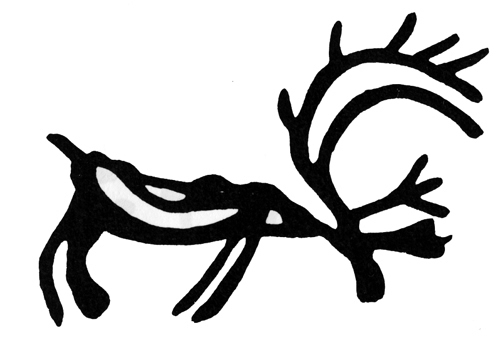 The word for reindeer in the North Sámi dialect is boazu/bohccot (singular/plural). 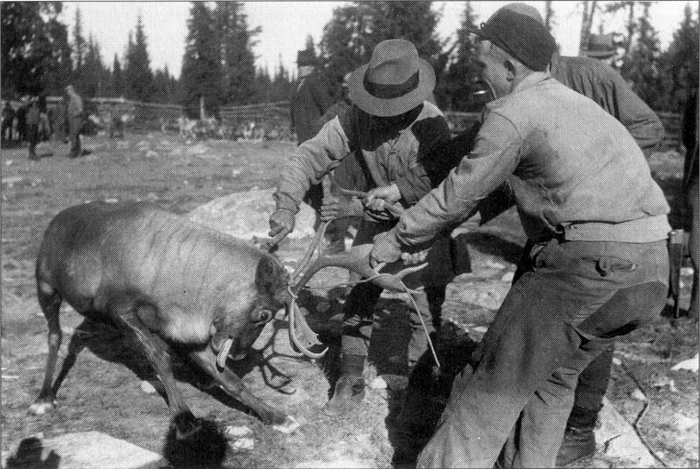 The reindeer helped make it possible to push the frontiers of human settlement to the north into less hospitable environments. With regard to demographic traits and behavioral patterns the reindeer of today are essentially the same as the wild reindeer hunted during the late Stone Age in Fennoscandia (the Scandinavian peninsula) after the glaciers began to recede some ten thousand years ago. They are distinguished by their tolerance and even preference for cold climates, and by their gregarious nature. They are herbivorous, eating plants in the summer and lichen under the snow in winter. They are usually found together in numbers of fifteen or more, and at certain times of the year in herds numbering into the thousands. They are not dangerous to humans and were often quite easy to kill, being extremely unwary at times. Both sexes carry antlers, the male shedding his after the rut in October, the female shedding hers after calving in spring. Their hides and hair provide extremely good insulation from the cold because the outer guard hairs contain vacuolated, keratinized cells, which resemble balloons. As a result of this, reindeer float when killed in water. These skins were one of the many features that made them desirable as a human resource so early. 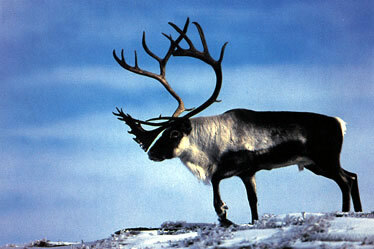 Typically reindeer are in the habit of migrating seasonally. They are on the move at all times, spending the late spring and summer on the arctic tundra or coast and moving inland to the boreal forests of the taiga for the winter. 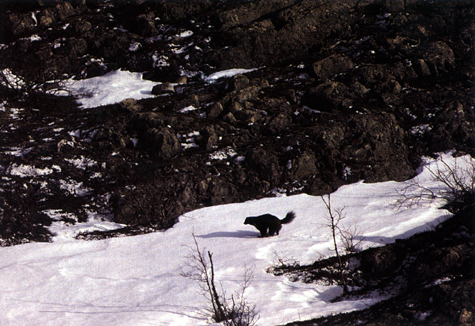 There are many factors which may in part account for these migrations: 1) Most important is the constant search for food; 2) Better shelter in the forest during the bitter winters; 3) Calving on the tundra preferable to the still deep snows of the taiga; 4) Summer insect problems: the reindeer are plagued by flies, mosquitoes and other insects during the summer, and there are fewer insects on the tundra. Habitat  Reindeer are found throughout the circumpolar north, in Eurasia where they are called reindeer and in North America where they are called caribou. All reindeer belong to the species Rangifer tarandus and they in turn are members of the deer family (Cervidæ). The word rangifer derives from an Old French word presumably meaning "animals that walk in a single file" referring to their migratory pattern. There are seven sub-species of reindeer of which only two are found in Fennoscandia: Eurasian tundra (or mountain) reindeer (R. t. tarandus) in Norway, Sweden, Finland and Russia and Eurasian forest reindeer (R. t. fennicus) in Finland and Russia. The forest reindeer have longer legs and larger feet than the mountain reindeer. The Eurasian tundra reindeer originated in Eastern Siberia and Alaska and wandered west through the tundra and forest and reached Scandinavia soon after the glaciers disappeared. They are more gregarious and have accordingly been somewhat easier to domesticate than their forest counterparts. They have been able to adapt to a variety of habitats and are found as far north as 82º N in Canada and as far south as 50º N in Canada and China. In all there are probably over five million reindeer in the arctic and sub-arctic zones. 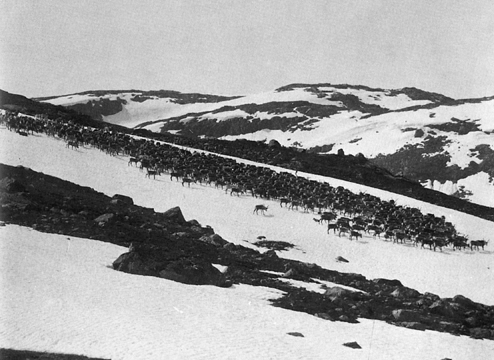 Reindeer tend to congregate in herds, which at times can number in the thousands. Physical Traits  Reindeer are shy animals just as other members of the deer family, but their shyness is offset by their curiosity. In difficult terrain they will occasionally come up to humans. Reindeer are strong animals with great endurance. They are capable of trotting at 25 mph and have been known to cover 500 air miles in six weeks over all sorts of terrain. They can run nearly twice as fast when escaping predators. Their speed comes from long, powerful legs. The shovel-like front hooves provide good footing and allow them to dig through snow in the winter to reach lichen. Bulls (sarves) can weigh more than 200 pounds, females as much as 180 pounds. Reindeer lose their winter coats in July and by mid-August new pelts are already in place. Mating is at the beginning of October. Antlers  Antlers are the reindeers main weapon and are made of bone. They come in pairs where left and right are quite similar. Antlers grow very rapidly beginning in April and ending in August or September. Reindeer are the only members of the deer family where the females have antlers (obviously Santa's reindeer were females). Males shed their antlers in the fall two to three weeks after the rut, the more dominant shedding earlier. Cows who are not pregnant shed theirs in March or April, while pregnant cows keep theirs until just before or just after calving. This means that males with their generally larger antlers are dominant for a short time in the fall and females are dominant throughout the winter. Why did female reindeer develop antlers? Males use theirs mainly against other males during the rut, but smaller females have the advantage in the winter when males and females are together. 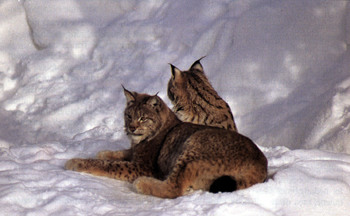 The females compete for the craters or depressions in the snow that are valuable food resources and can keep the males away from them. 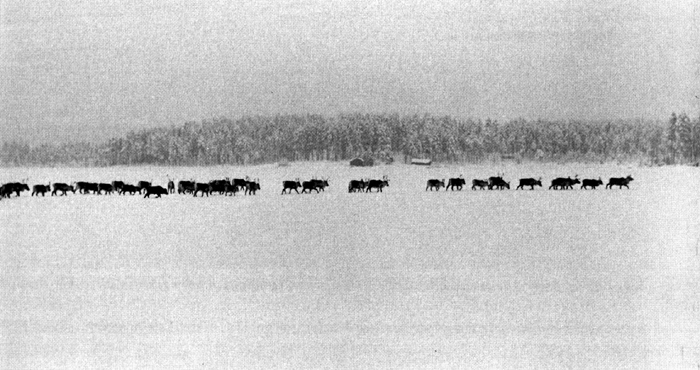 Migration and Diet  Reindeer wander in regular patterns in search of food, to escape flies and other insects, and the cows to get to their spring calving grounds. Their need for nourishment is proportional to the length of the daylight, less in winter and more in summer. Reindeer usually spend the winter in the forests of the taiga where they also gain a measure of protection from the harsh winds and cold temperatures. Winter is a time to draw on stored body fat and simply survive. When the ground is covered by snow, they prefer lichen, also called reindeer moss. Lichen is more accessible beneath the drier and lighter inland snow. The herd can only spend a short time in each area in that the snow gets tramped down and thus the lichen beds become harder to reach. Winter can be very difficult for reindeer especially when snow melts and freezes again into an ice layer impossible to penetrate, as is often the case in areas closer to the coast. Unless they can get to ice-free pastures they can starve and even die. As winter draws on food supplies dwindle and there is more competition for remaining resources. Pregnant cows often fare better in the winter using their antlers to control the best lichen beds. Summer is the time to put on weight and fatten up. In early spring when the snow begins to disappear in spots they seek the tender grasses and other plants that are beginning to grow again. Then they eat grass, sedges, herbs and wild rice and in early autumn they prefer mushrooms and other fungi that contain more fat and protein. The summer is spent on the tundra or on the coast. Calving Grounds  Pregnant females return to the same calving grounds year after year, usually near the tree line. Remarkably, the large majority of calves are born within a very brief period of time, beginning in mid-May (see below). This is just as the snow starts to retreat and new plant growth to appear. Since the snow cover melts earlier in some spots and since different types of vegetation begin to grow at different times, the period of early plant growth can last up to seventy days. Hence, calves have a relatively long period to gain strength and a better chance to survive. 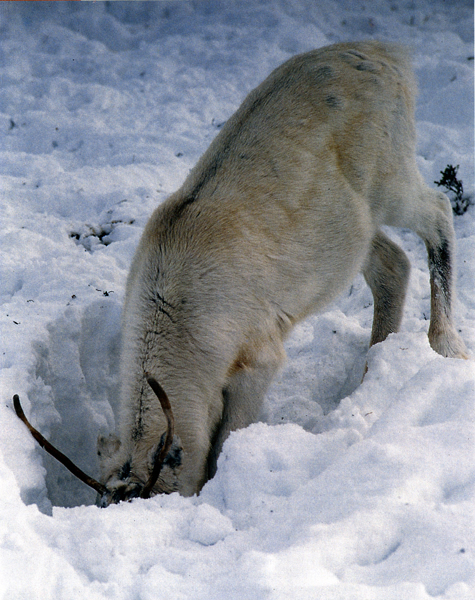 Cratering  Cratering refers to the reindeer digging through deep snow to find the lichen they can smell. 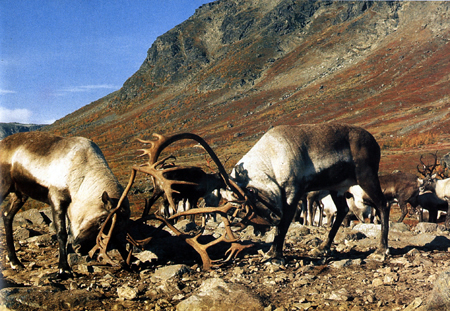 Several reindeer dig in the same area, gradually expanding the area dug. These depressions are not usually more than a foot deep but can be up to three feet deep in the looser snow of the forest. There is often competition for these craters or hollows, and the pregnant cows with antlers are able to control them. Bulls, now without antlers, do not waste energy in competing for them. Since it is easier to take over a crater than to dig a new one there is often competition for one already dug. A pregnant cow may go up to a nearby crater controlled by a reindeer with less rank and toss her head and antlers. The other reindeer will usually give way. Such competition increases as winter progresses. Clockwise from upper-left: Lynx, Bear, Wolverine, Wolves. Ottar 3.93, pp.15, 20, 26, 34. 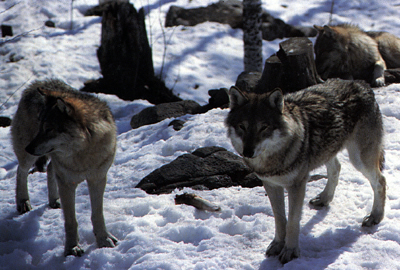 Predators  The reindeers predators include the lynx, wolverine and bear, but most feared are wolves. 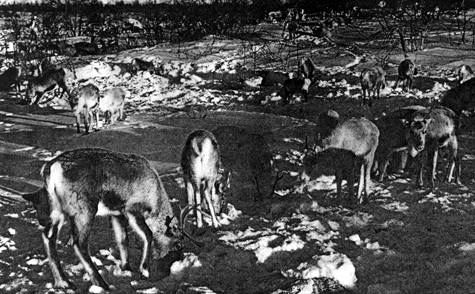 Reindeer evolved alongside of wolves, and strategies used by reindeer to avoid risk include: 1) Hiding from predators; 2) Wandering over large areas to put distance between themselves and predators; 3) Outrunning predators in case of immediate danger; and 4) Gathering into large groups or herds. Furthermore, the birth periods of the predators correspond to the calving time of the reindeer. Large predators are not so mobile when their own young are born. They remain close to their lairs, which are near the reindeers winter grazing grounds. By this time cows and calves are at the calving grounds far from their winter grazing pastures. Still the most dangerous time for reindeer is during and right after calving when young calves are quite vulnerable. The mother finds a partially concealed spot somewhat removed from other mothers. The newborn calves are camouflaged in the broken terrain and soon become mobile. After a few days mother and calf join a larger nursery group of mothers and calves. This large group of cows and calves born at roughly the same time also provides a measure of protection. Some reindeer have their calving grounds on islands off the coast of Finnmark and Troms that they have to swim to. This strategy may have developed as a way to escape predators at calving time. Daily Rhythms and Synchrony  The daily routine for reindeer involves an alternation between periods of activity and rest. After several hours of grazing the animals lie down to rest and ruminate. 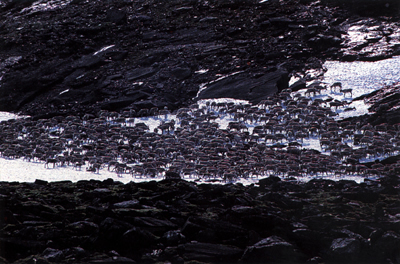 No matter how large the herd is the reindeer tend to synchronize their activities. When a leader switches from grazing to resting the entire herd follows suit. The synchrony in calving - so many calves born within a relatively short time frame - means that breeding in October must occur over a short period of time, as little as one week. 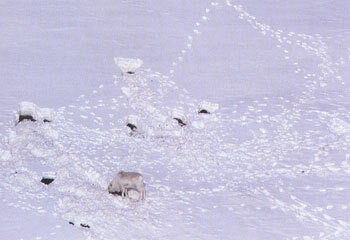 Dominance and Leader/Follower Relationships  Dominance and leadership refer to social relationships within a reindeer herd. Dominance is status or rank that derives from physical size and strength and most importantly from antlers. Both sexes have antlers in the fall, but the males have larger antlers than the females and are larger and stronger. So they are dominant until after the rut when they lose their antlers. Then the females become dominant throughout the winter and spring. 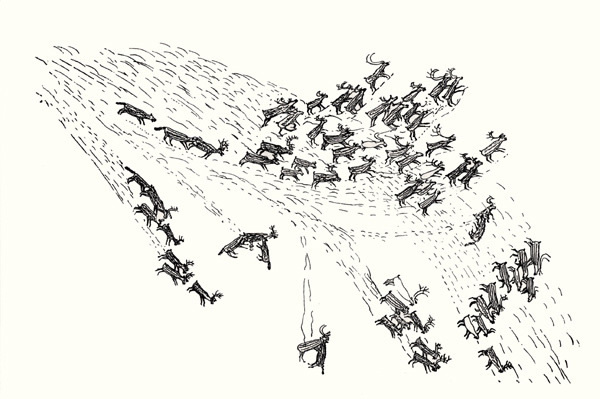 Leadership is connected with security: when reindeer become frightened they seek shelter in the herd, and, of course, the center of the herd is the safest place. 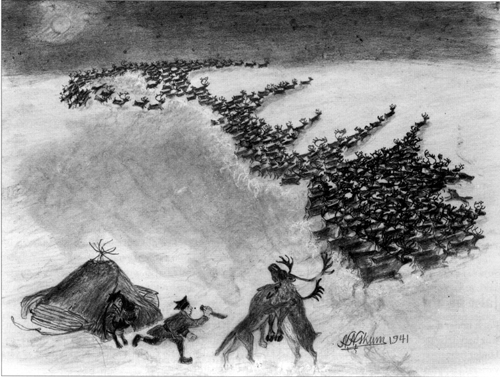 Experienced reindeer exhibit leadership in the face of alarm, leading the herd if necessary away from the danger. 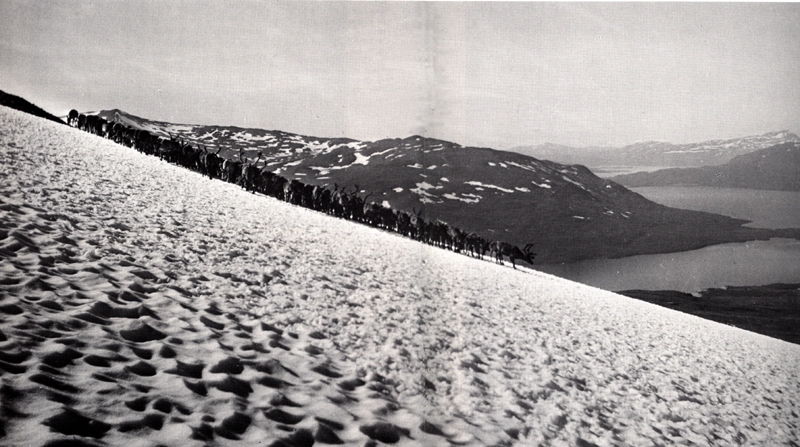 And as mentioned under Daily Rhythms most reindeer are followers: they look for indications of leadership. Whatever the leader does the herd follows even if some of the members of the herd are far behind the leader. Harems  Dominant bulls maintain harems of from a dozen to eighty cows. They prevent the cows from straying and they protect their harems from challenging bulls. They are usually able to keep younger bulls away with threatening behavior, such as antler rushes at other males, beating bushes with antlers and pawing the ground. If a senior bull loses his harem, he tries to exert authority over other bulls and cows. The rut and breeding period is very demanding for the senior males. They have little or no time to graze or rest and by the end of the period they can be extremely exhausted. Social Organization  According to Paine the three principles of social organization are synchrony, dominance and leadership. "Each animal has a place in the group according to a definite dominance hierarchy to the extent that one can predict the outcome of almost any confrontation." The members of the group live in a "definable pattern of social interactions, with no constancy of group composition." Uses  For early hunter/gatherers the reindeer was the ideal prey, providing meat for the diet, hides for clothing and tents, sinews for thread and lines, bones and antlers for tools and weapons, and teeth for ornamentation. Clearly meat was the most important of these. It could be preserved in various ways by salting, drying and smoking. Dried reindeer meat  jerky  was an excellent source of protein that lasted long and tasted good. The innards too were used: the various stomachs as containers and sausage casings. The contents of the stomach  rich in vitamin C  were eaten, and they carefully saved the blood to eat or to give to their dogs. 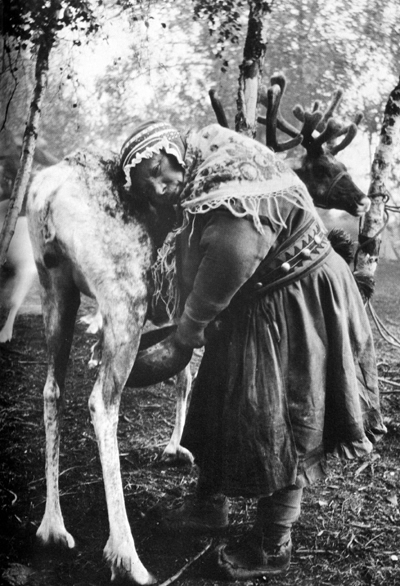 Later on when the Sámi had become reindeer herders females were sometimes milked. If there was milking, it happened once or twice a day from the end of June for four to five months. The milking spots had to be changed frequently to get to newer pastures and to prevent hoof and mouth disease. The cows were lassoed if necessary. A man would hold the cow while a woman milked it. The milk  about a cupful  was caught in a náhppi, a round wooden cup with the rim curving inward to prevent the milk from spilling. The milk was very rich with up to 25% fat, 10% protein and 4% lactose. It was preserved in kegs. There was little danger of short-term spoilage because of the relatively cool temperatures. To get more milk wooden pins were sometimes put in the calves' mouths to prevent them from nursing. Cheese was made from reindeer milk by warming it and hanging it up inside a reindeer stomach. The inside of the stomach contained rennet that caused the milk to curdle. Cheese could last well into the winter and was easily transportable. They also drank milk, made butter, and frozen milk was their ice cream. 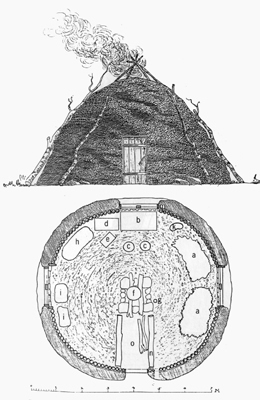 Reindeer hides were used to cover Sámi tents (the goahti or larger, more permanent tent and the lávvu or summer tent). Inside the tent they sat on reindeer skins. 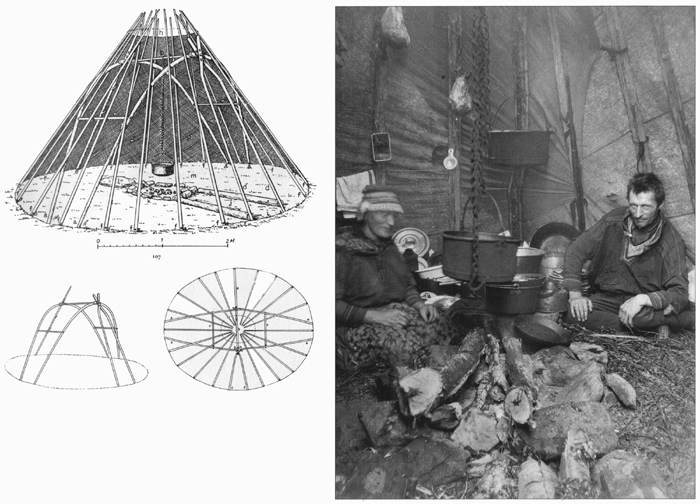 The hides were also used to make extremely warm clothing. Leg skins were used for shoes and gloves. Bones and antlers were used for handicraft products. And sinews to sew with came mostly from the legs and back. In short, virtually every part of the animal was used. 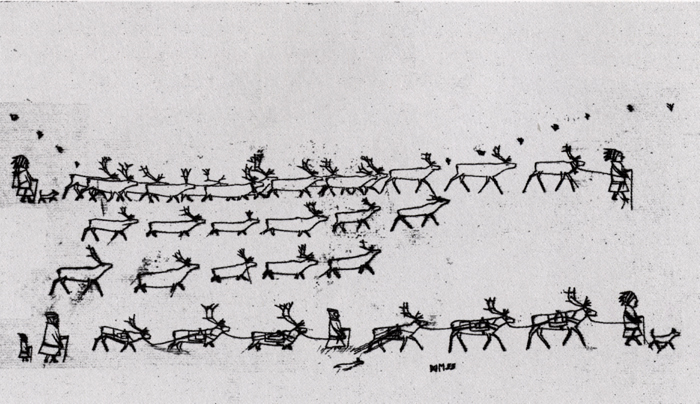 Reindeer were also used alive, females as decoy animals, males as pack animals and as draught animals to pull Sámi sleds (pulk). 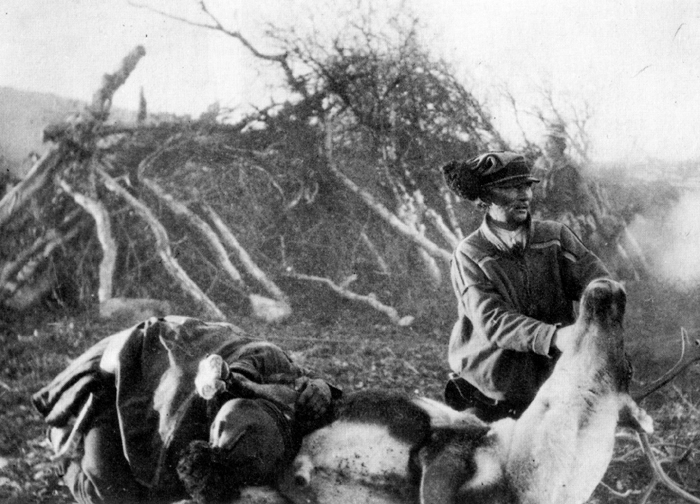 To produce pack and draught reindeer bulls were castrated during the early autumn. One man would hold the reindeer down while another would bite the testicles to pieces with his teeth and massage them with the hands. This method left no open sores and within a few days the swelling was gone. Reindeer may have been first tamed as much as 6,500 years ago. Look at the rock carving from Zalavrouga from 4,500 BC. There is a human phallic figure with a tail  it was not uncommon for hunters to dress up as animals in order to better commune with nature and facilitate their hunting. The hunter is on skis and has a bow in hand. Under certain conditions  deep snow at winter pastures  it was quite easy for hunters on skis to approach the reindeer. The line going toward the reindeer may also be a lasso. The Sámi word dolgastit is the equivalent of the Norwegian word snørekjøre and it means "to be pulled on skis by a reindeer." 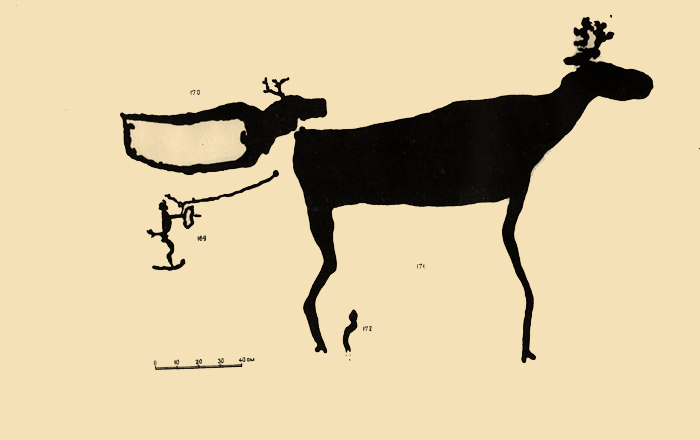 In earlier times a hunter may have caught up with a reindeer in deep snow and gotten a lasso around the animal's neck. If he was unable to tie the other end of the lasso to a tree the hunter may just have hung on and been pulled by the reindeer until it became tired. This would have been a way to capture a reindeer and tame it so that it could later be used as a decoy or draught animal. Eira, Nils Isak. Bohccuid Luhtte. DAT, 1994. Forseth, Björn. Samelandets historia. Ekelunds Förlag AB, 2000. Kjellström, Rolf. Samernas Liv. Carlssons Bokförlag, 2000. Kjellström, Rolf and Håkan Rydving. Den samiska trumman. Nordiska Museet, 1988. Manker, Ernst. Medmänniskor i Norr. Sinklarförlaget, 1978. Ottar 2  93. Rein. Tromsø Museum, 1993. Ottar 3  93. Rovdyr. Tromsø Museum, 1993. 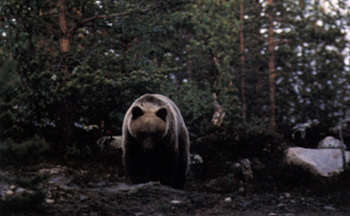 Ottar 3  96. Reinbeite. Tromsø Museum, 1996. Paine, Robert. 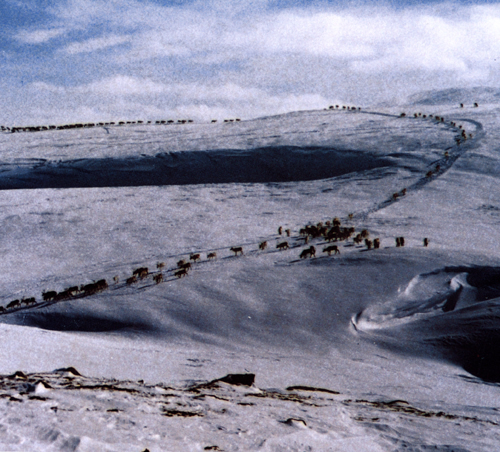 Herds of the Tundra. Smithsonian, 1994. Ravdonikas, V.I. Naskal'nye Izobrazhenija Onezhskogo ozera i Belogo Morja. v.2. Izdatel'stvo Akademii Nauk SSSR, 1938. Uddenberg, Nils. Renarna, markerna och människorna. Bokförlaget Nya Doxa, 2000. Valkeapää, Nils-Aslak. Beaivi, Áhcázan. DAT, 1991. 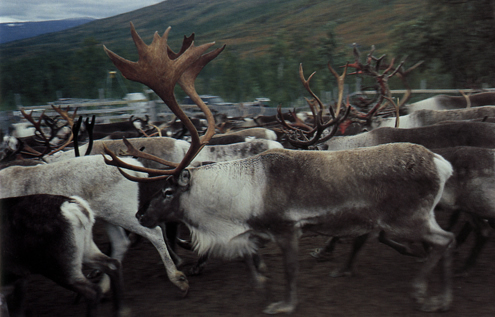 Click the button above to access photographs, videoclips, and Sámi poetry concerning reindeer.